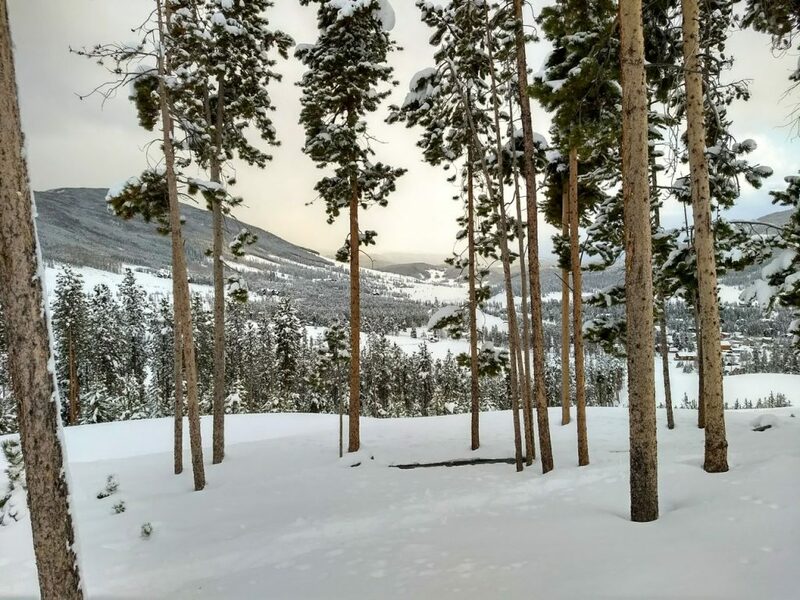 Colorado in general, and Breckenridge specifically is world-famous for its alpine skiing. But the 360 inches of snow they average each winter makes it an amazing destination for snowshoeing, too! I was out at Breck for a couple days on a recent trip to Colorado to visit family. Not only did we get out downhill skiing (my first time in 19 years! ), I had brought my snowshoes along so I could enjoy the slower pace of the trails, too. This was a banner year for snow in the Twin Cities where I live. 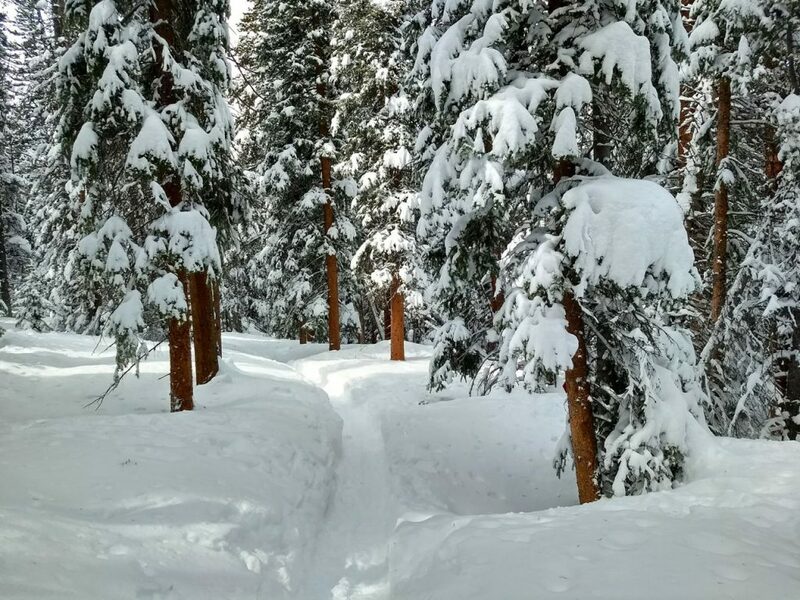 It’s been an exceptional year for snow in the Colorado mountains, too. As if to reiterate that, we got 30 inches of fresh powder in the two days we were out there! 30 inches of fresh snow in two days! What beauty! And warmer than our temps had been in Minnesota, so that was a plus for us. We could enjoy being out in this winter wonderland without wearing so many layers. 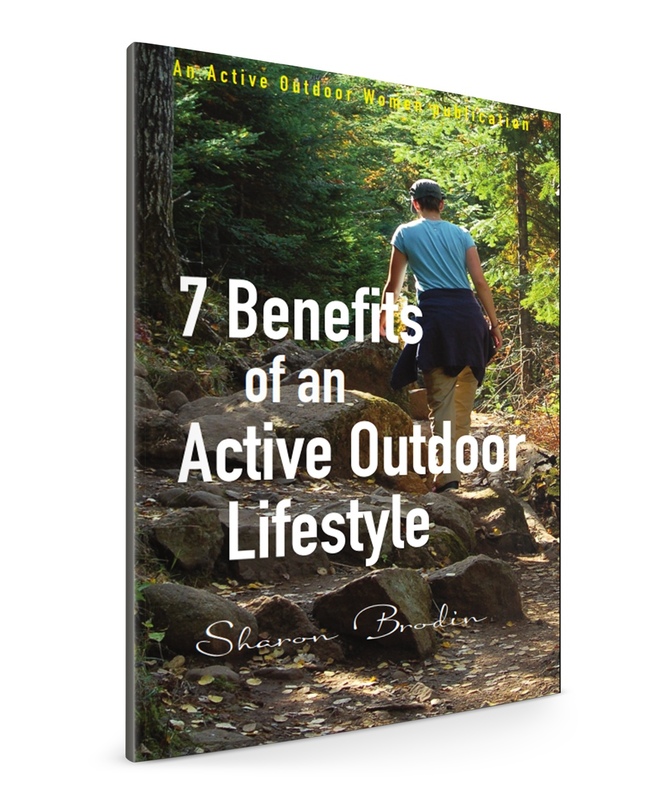 If you’ve been snowshoeing in deep snow, you know that trail blazing is hard work! The nice thing about finding trails is you can enjoy the beauty and not have to work so hard. 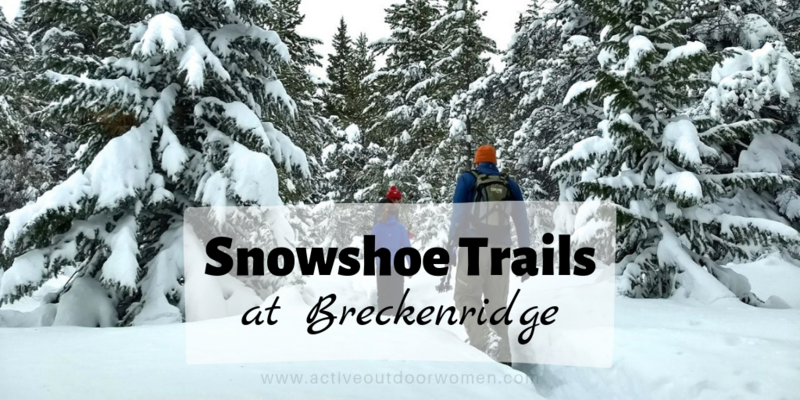 So while you can snowshoe anywhere there’s public land and snow, paying to use trails in a place as gorgeous as Breck is excusable occasionally (especially if you’re from out-of-state like we were!). My older brother, David, and his wife, Kris, and I decided to go for the gusto and sign-up for a semi-private guided trek. It turned out to be a fun investment. Our guide, Henry, was super personable and knew his stuff well. And then since the trek included our trail pass, we could’ve spent as long as we’d wanted the rest of the day to keep exploring (the $23 trail pass is good for the whole day). Or we could’ve traded our snowshoes for nordic skis and tried out their pristinely-tracked cross country trails. Other benefits of choosing the guided trek: Henry had a couple water bottles each for us (that he carried), we could’ve gotten free hot chocolate back at the Nordic Center if we’d wanted to, and Dave and Kris were able to try out their rental boots without having to pay to rent them (we all had our own equipment). We all agreed it was a great experience. And Kris may have found a new cardio workout—Henry told her running in snowshoes is a thing—so she had to try it, of course! 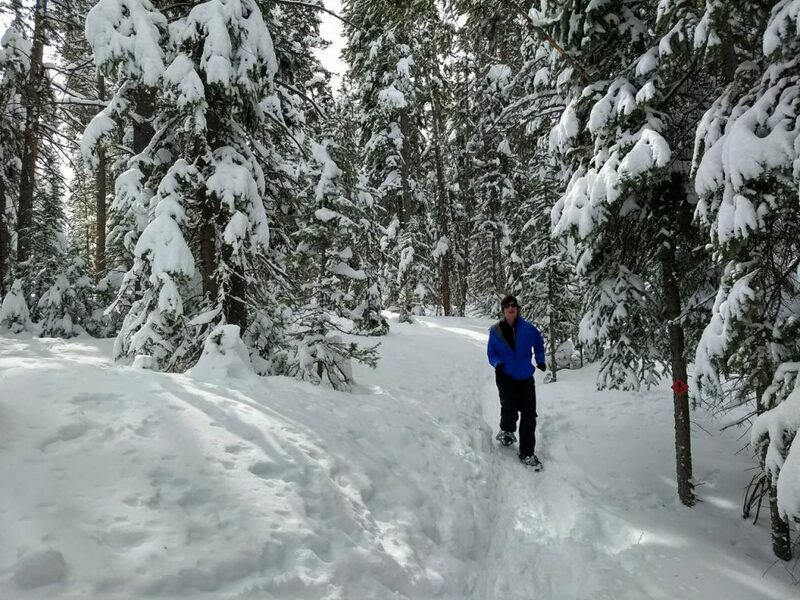 Running in snowshoes—a definite cardio workout! 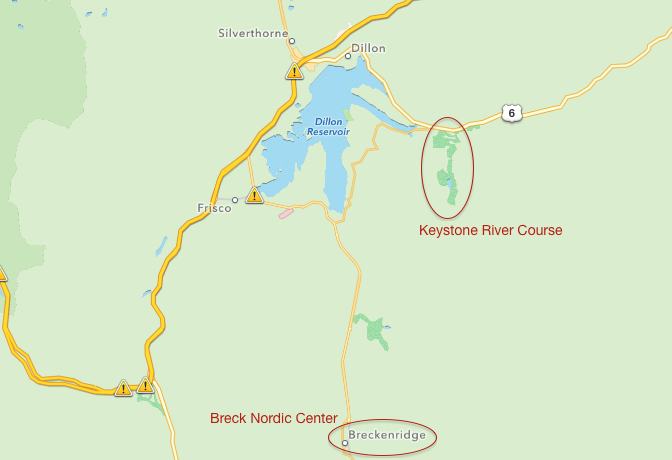 My younger brother, Joel, spends lots of time in the Dillon/Silverthorne/Breck area. He knew of a gorgeous snowshoe trail on the Keystone River Golf Course in Dillon. 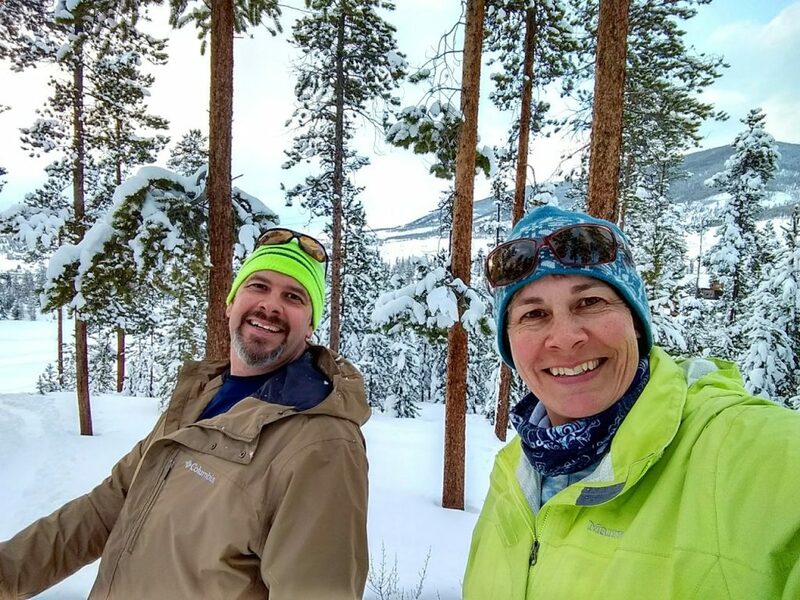 So after a full day of alpine skiing at Breck, he and I couldn’t resist strapping on our snowshoes as the sun came out late in the afternoon. We hit the trail about 4:30. I don’t know what I was expecting, but it wasn’t scenery this stunning! It was absolutely gorgeous. Of course, it always helps to have a thick blanket of fresh snow and beautiful lighting. One of my favorite things about Colorado are the lodgepole pine, ponderosa pine and aspen trees. They’re different than what we have in Minnesota. 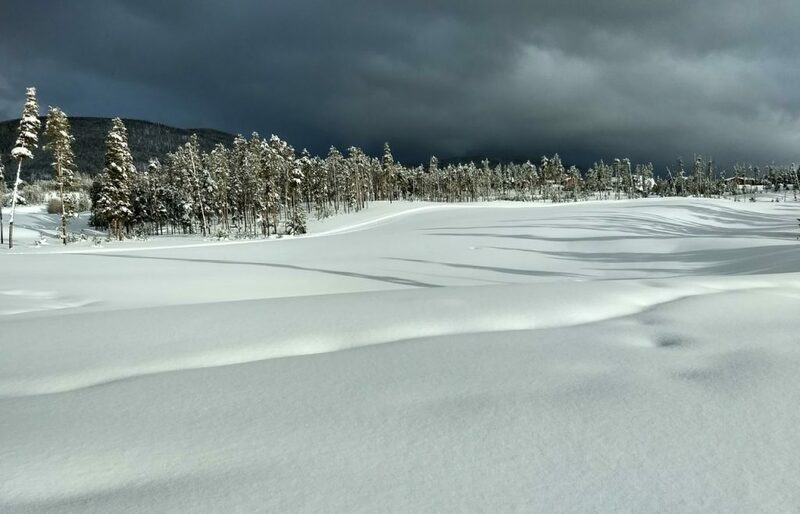 The ponderosa pine, especially, were so cool set against the deep snow. The trail was a fantastic variety of hills and valleys, in the trees and out in the open. There are several vistas overlooking the surrounding valleys and mountains in different directions. I would say this trail is even prettier than the one in Breck for views.